Dorner’s AquaPruf Ultimate series of sanitary conveyors have been designed for fast and effective sanitation in the most demanding of environments. 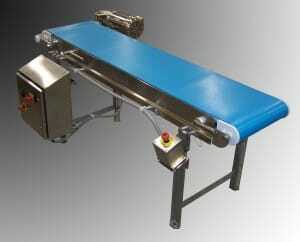 In these environments, withstanding high pressure spray sanitation and eliminating horizontal surfaces for complete drainage are musts for sanitary conveyors. Another requirement of every Dorner conveyor regardless of sanitation level is providing a safe work area for operators. A simple and effective means of increasing the overall safety of individual conveyor is to utilize an in-line cord emergency stop kit. At times sanitation and safety can be at odds with one another, but Dorner engineers have amassed considerable knowledge and experience over the past several years to provide a sanitary and safe design to our customers whenever the need arises.